Make this easy, customizable kid's clock project in any color or theme. Frisbee with a smooth center circle. Glue gun with glue for light toys, Superglue for heavier toys. Use your ruler to find the center of the frisbee and drill a hole in that center with the 3/8 or 1/2 inch drill bit. If your frisbee has words, logos, or labels in the center that you don't want to see, spray paint the frisbee in a well ventilated area over some old newspaper. Let dry. Next, if you spray painted your frisbee, spray a coat of acrylic sealer over the frisbee and let dry. Follow the directions on your clock kit for putting the clock together using the frisbee as your clock face. Decide how you will arrange your selected toys or accessories on the frisbee around the clock. Use bedroom colors on the frisbee and try these fun ideas; Lego mini figures, Polly Pockets, Star Wars, Winnie the Pooh, Baby blocks or Wooden Letters spelling the child's name etc... Whatever the favorite theme, this is a fun clock to do. 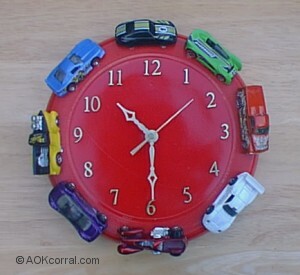 Use as a clock for child's room, baby's room, or any room. Simply change the accessories and colors to suit your theme.